I took a deep breath and followed Warren over the edge. 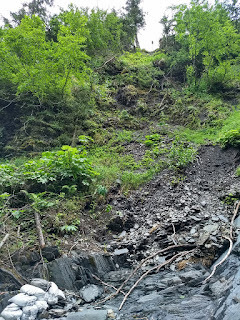 Damp soil crumbled and slid under the soles of my muck boots, and a network of roots provided a little traction on the steep angle of the stream ravine. The slender, pliable stems of alders made tenuous handholds, and shook raindrops down on my head whenever I used them. 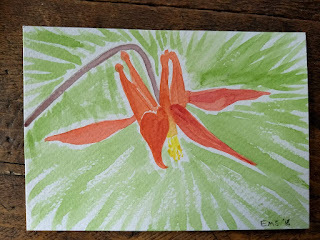 “Don’t grab onto that one,” said Warren as he pointed at a tall, lush patch of Devil’s Club stems, all armored with sharp spines. 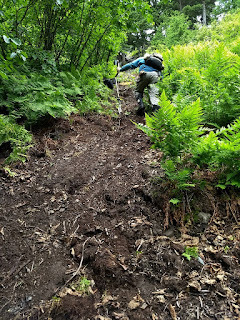 No one ever said that gold mining was easy. 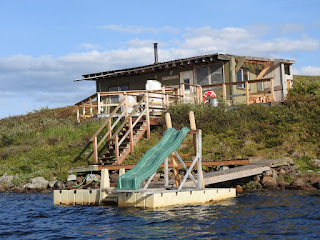 And yet, when my Wisconsin neighbor, Frosty Palmer, emailed, “If you do head down the Kenai Peninsula, stop in to see my brother Warren who built a real cute place in Cooper Landing. 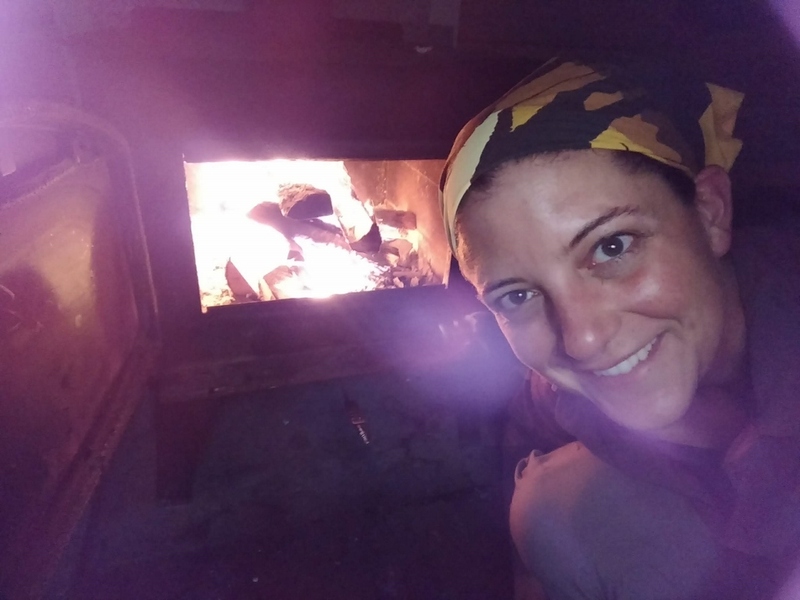 He would probably even be willing to take you out for a day of gold mining,” I took him up on the offer. 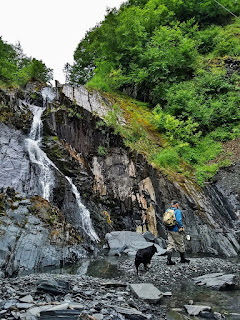 Straightening up and dusting myself off, I splashed a few yards upstream to join Warren and his Australian Shepherd, Quinn, at the base of the narrow waterfall that marks the head of his mining claim. 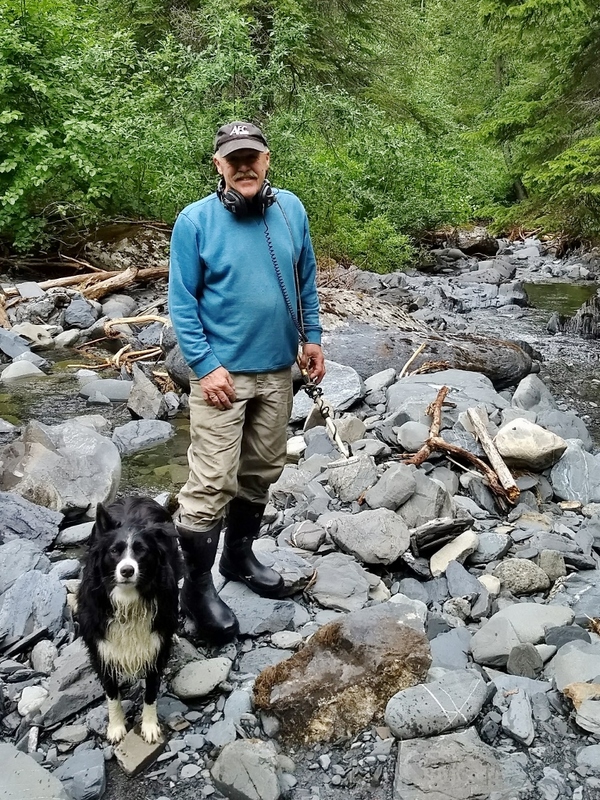 This past Father’s Day, a rip-roaring flood washed away all of the dredging equipment and infrastructure he’d installed in the creek. 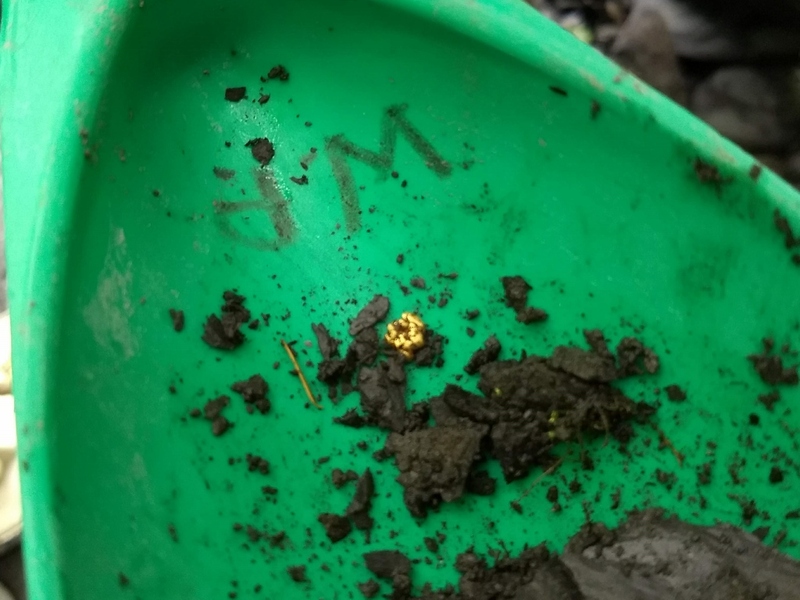 Despite all the work and expense that had disappeared downstream, Warren was excited at the prospect that new gold might have washed into his claim, too. Luckily, his metal detector had been safely at home with him. 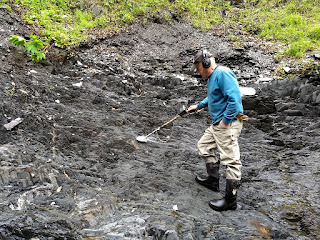 Headphones on, he swung it in low arcs over the fractured slate bedrock, listening for the telltale beeps. 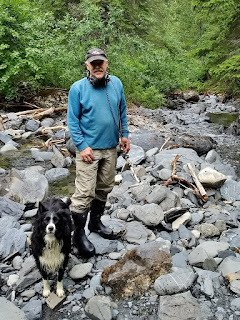 Warren Palmer and his trusty companion, Quinn, were kind enough to show me around their gold claim in Alaska. Photo by Emily Stone. Warren caught gold fever back in1986, in Tok, Alaska. 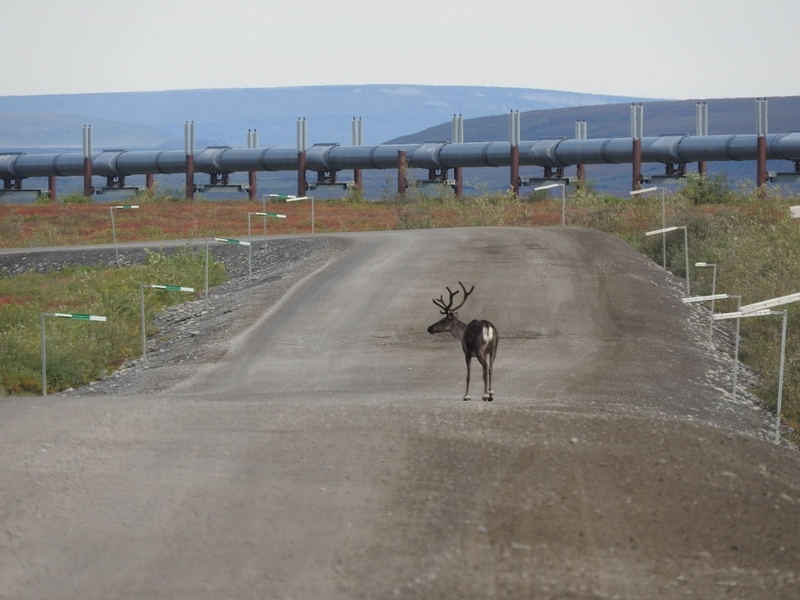 He was working on repairs to the Alcan Highway and went into town for supplies. The gal behind the counter at the grocery store brought out a pan heaped with gold and topped with a nugget the size of his fist. That’s not even the most incredible of Warren’s many stories about surveying Alaska. Treasure hunting is fun at any age, and we both got excited when the metal detector first started beeping over a section of jagged slate, its sedimentary layers turned vertical during the formation of the Kenai Mountains. Sometime in the buried past, hot fluids carried gold and other minerals into faults and joints in the rocks. 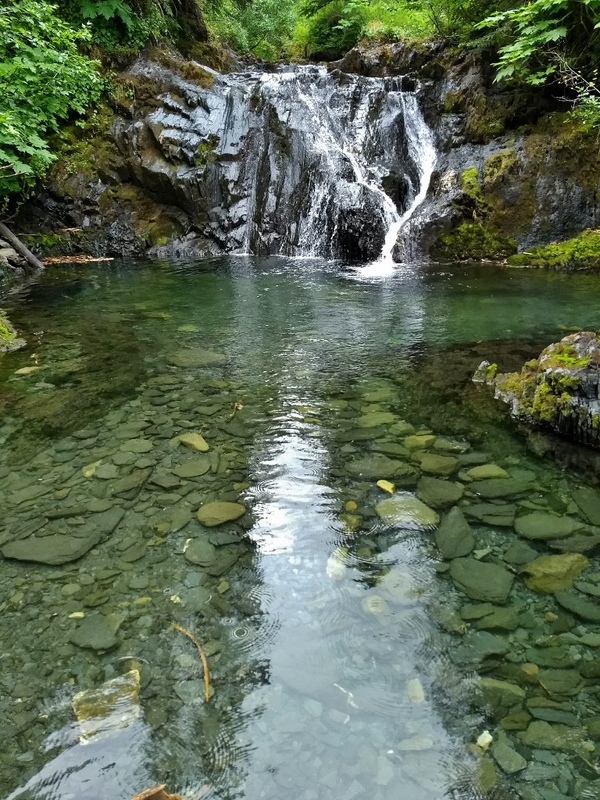 If you find gold still in the vein where it was deposited, that’s known as the lode—The Mother Lode. 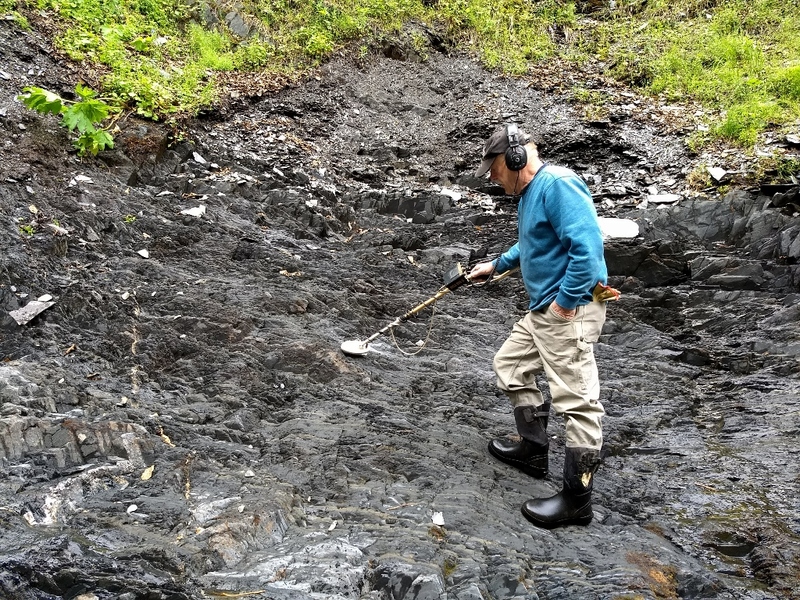 Warren Palmer’s mining equipment washed downstream in a flood, so he’s just using a metal detector to find placer old in the cracks and shallow sediments of his claim. Photo by Emily Stone. 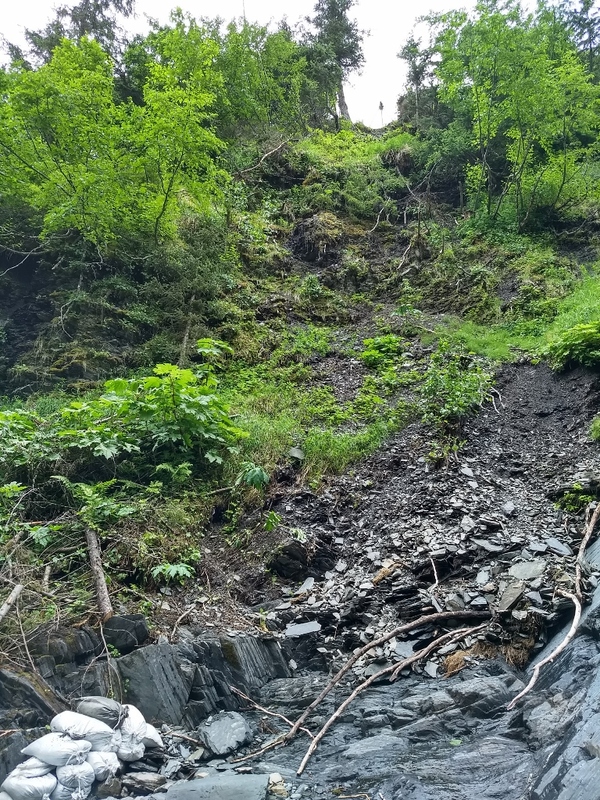 After homing in on the area with the strongest signal, Warren pulled out a pointed rock hammer and started to break and pull apart the layers. While this looked like solid bedrock, the layers in the slate had delaminated, and thin crevices opened up. 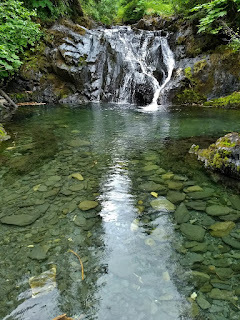 Flakes of gold freed from bedrock by the glaciers and transported by the stream can drop into nooks like this, or settle out in the slower current below rapids or boulders. 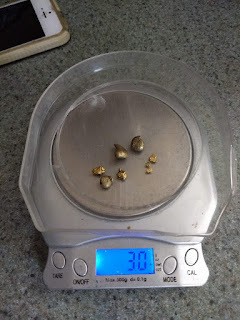 It is known as placer gold. Warren used his finger to scrape out a pile of sandy sediment from his newly enlarged crack and plop it into a green plastic scoop. 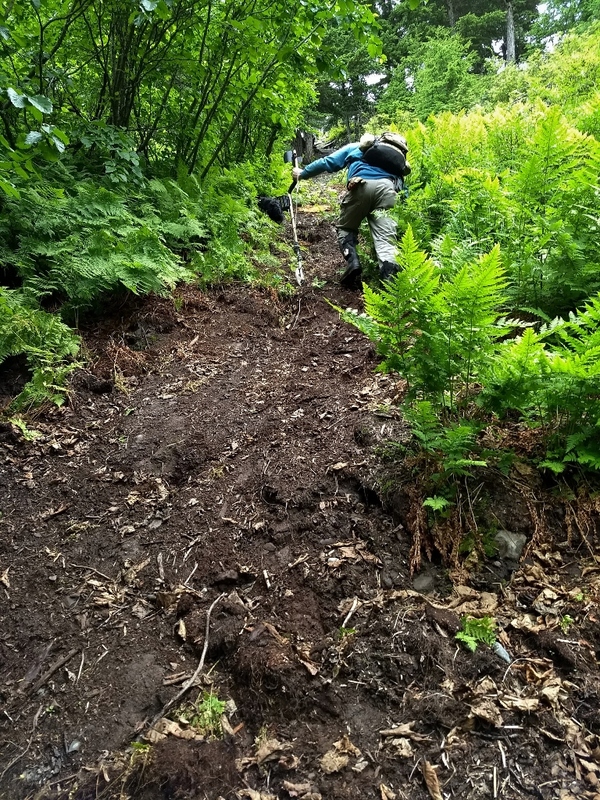 A quick pass of the scoop over his metal detector confirmed that the item of interest was still present. Handing the scoop to me now, Warren explained how to narrow down the search. I used my other hand to take about half the sediment out of the scoop. He ran the metal detector again. It was still in the scoop. I removed half again. This time the scoop didn’t beep, so I emptied it out and put my handful back in. Adding water, I swished the remaining sediment. Gold is 19 times heavier than water and also heavier than most sand grains. 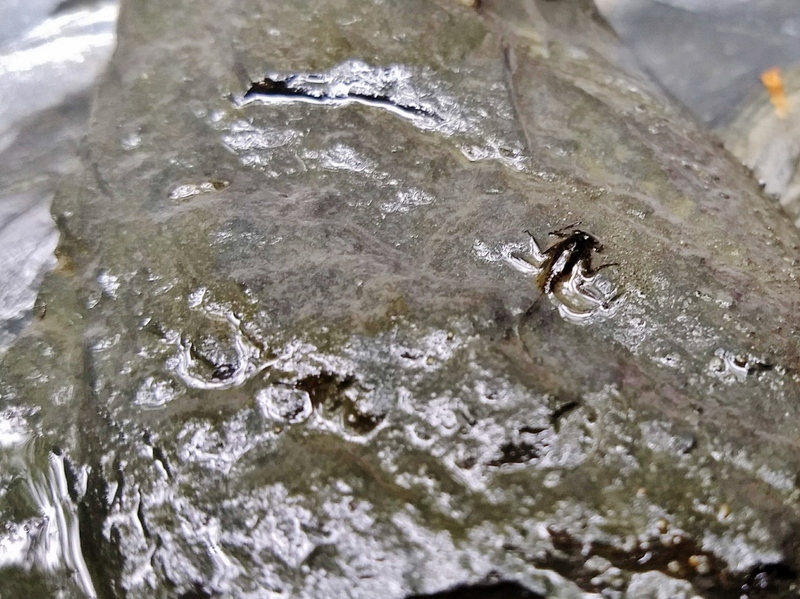 Its density is key to the mechanism of gold panning. Out of the sand settled an old rusty nail. Over the next couple of hours we pulled handfuls of old nails out of the creek’s sediments and crevices. I couldn’t believe some of the tight spaces they’d weaseled themselves into. I took turns running the metal detector and ripping apart punky slate with the rock hammer. 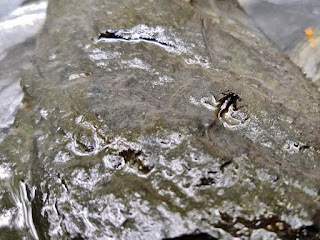 But just as often I poked around in the creek looking at bedrock formations, photographing little waterfalls, and lifting cobbles to see the flat-bodied mayfly nymphs clinging to their undersides. As fun as it was, that first glimmer of a gold flake in our green scoop added a special thrill and renewed our enthusiasm for the treasure hunt. Soon, Warren’s little glass vial held three flakes and five nuggets. Now at the bottom of his claim, we scrambled up a second impossibly steep trail and walked the gravel road back to his truck. He generously let me take some of the gold as a souvenir, and I insisted that he keep the biggest nugget, since it wouldn’t even fit in the vial. Post Script: Months later, just as I arrived back to work, I received an email from Warren. “Sad news, he wrote. “Those 3 large nuggets that we found at the bonfire site in the creek are not gold.” He suspects that the nuggets originated as brass grommets in some shredded tarps he burned after the flood. 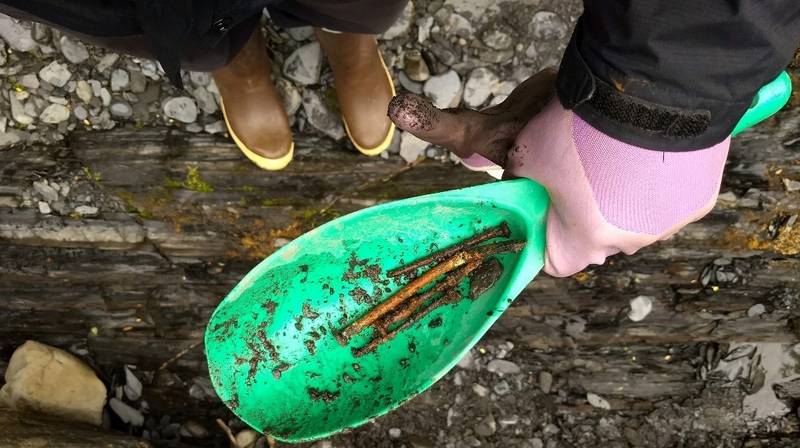 It’s no matter to me; the fun was all in the finding! 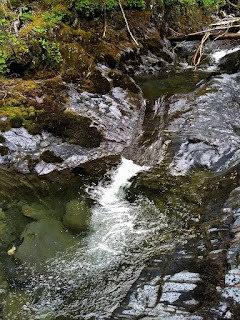 Warren’s gold claim was along a delightful little creek. 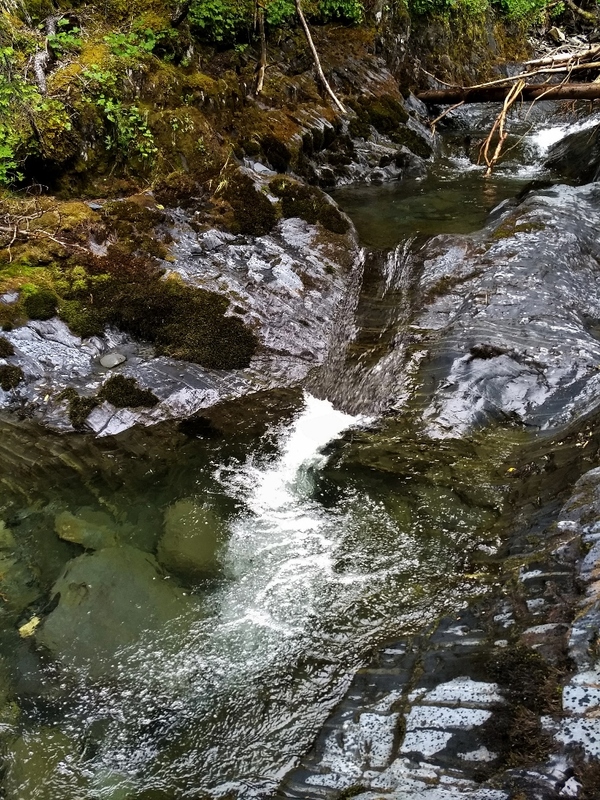 Heavy gold that has been broken out of bedrock and moved downstream will often collect at the base of waterfalls where the current slows. Photo by Emily Stone. 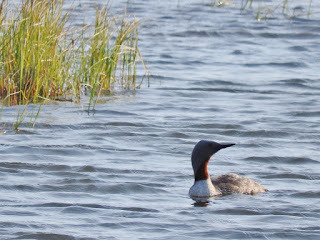 Common Loon on Lake Namakagon, Wisconsin. Photo by Emily Stone. 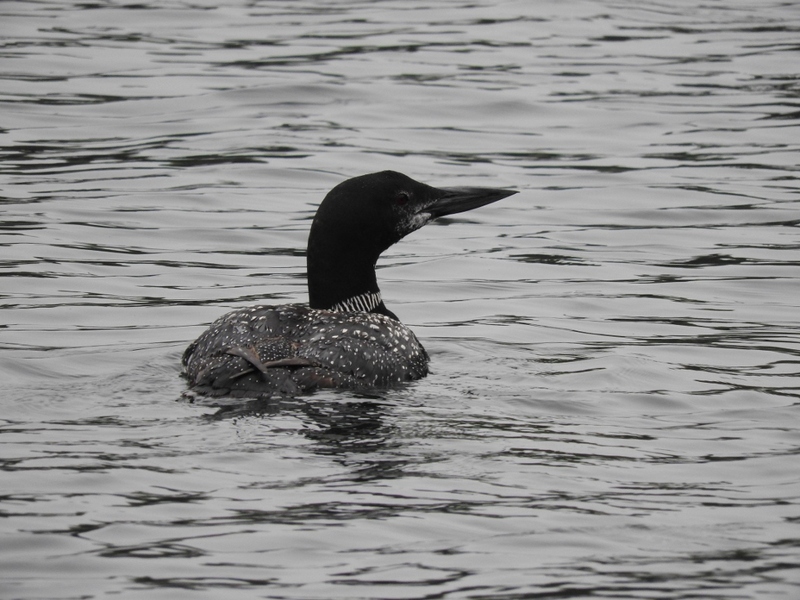 The haunting wail of a common loon drifted through my barely-cracked window one night last May. Amid leaning towers of books and clothes that would soon be headed to Alaska, I gave a wistful sigh. 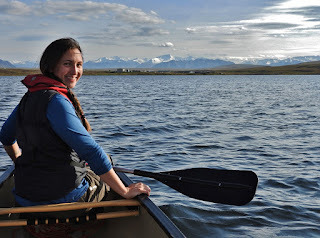 Of all the things I was sad about leaving for a summer, the loons on Lake Namakagon and my duties as naturalist on the Cable Natural History Museum’s weekly Loon Pontoon Tours were near the top of my list. 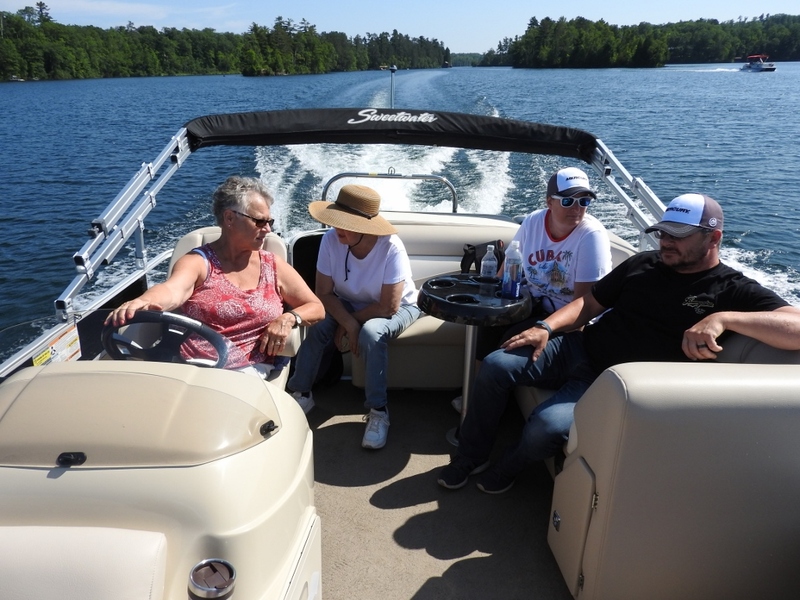 Loon Pontoon Tours are so much fun! This one was on beautiful Lake Owen. 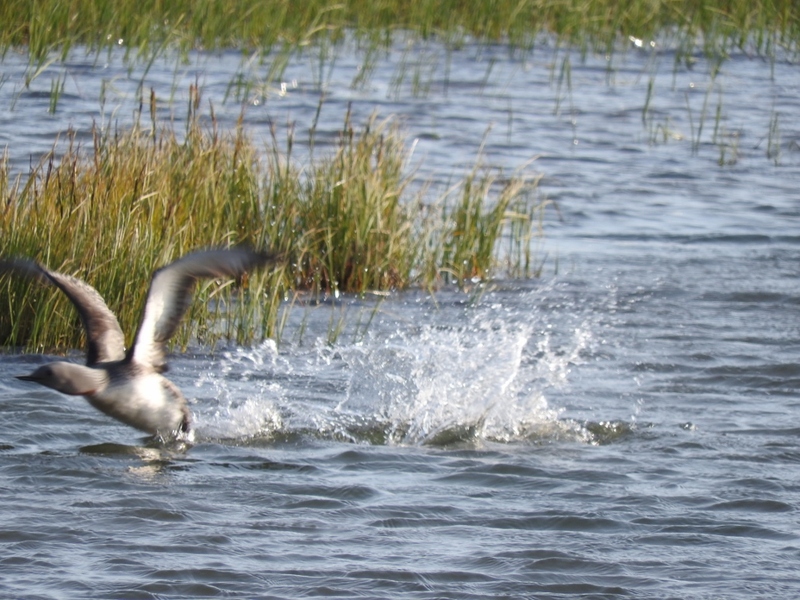 Sometimes we see incredible behaviors, like this loon rotating the eggs before starting a new sesson of incubation. Photo by Emily Stone. After seven years of studying loons’ adaptations and interpreting their behavior for visitors, I’ve developed a much deeper appreciation for these charismatic fish-eaters. Common loons are just the most southern-ranging (and therefore the most visible) of five different species of loons, though. 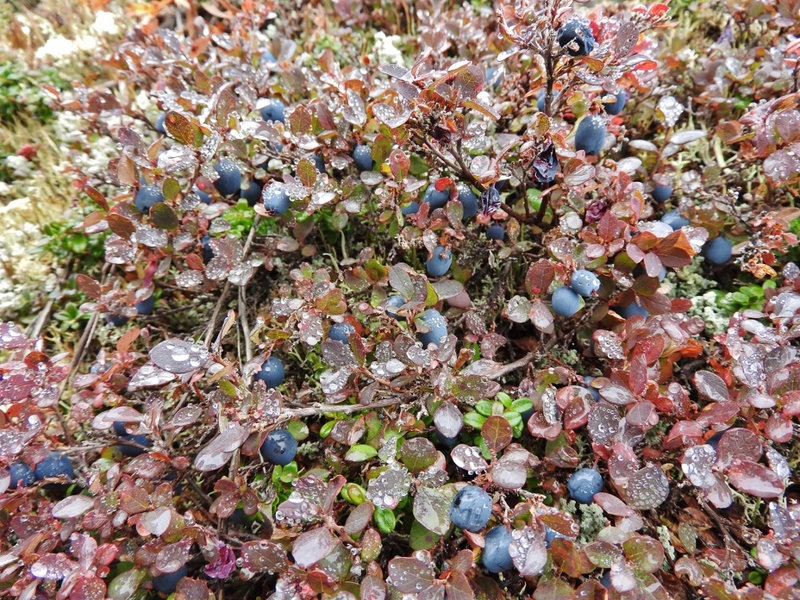 Despite their name, they aren’t even the most numerous! To my delight, common loons were a regular fixture in lakes along the highways I traveled during my sabbatical. 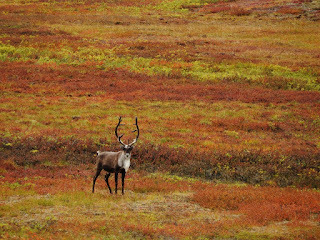 As I drove from Haines, AK, through a narrow arm of British Colombia, I gawked at my first treeless tundra of the trip. I also spotted two common loons, their bills tucked away against the cold, as they floated on a chilly lake. 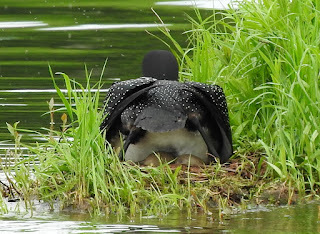 It was mid-July before I added to my list of loon species. 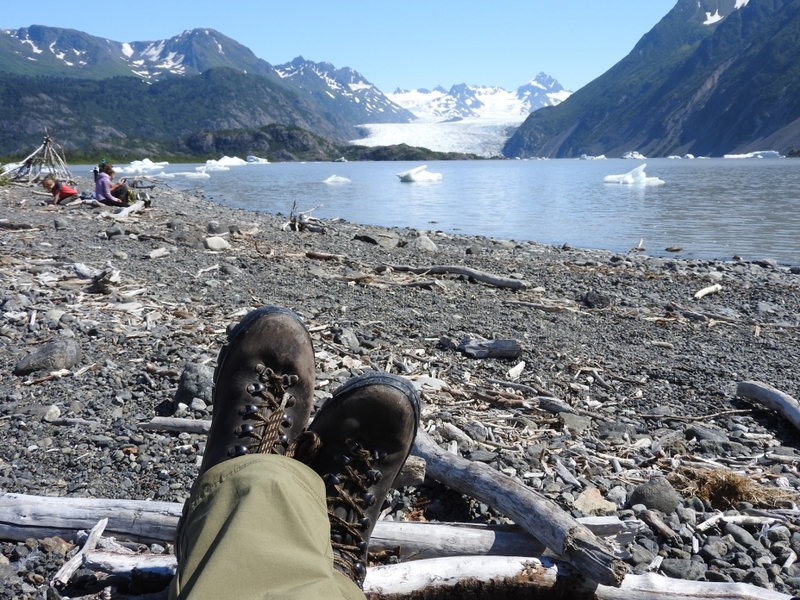 Ed Berg, a retired ecologist and geologist from Homer, had just taken me across Kachemak Bay to see the Grewingk Glacier. 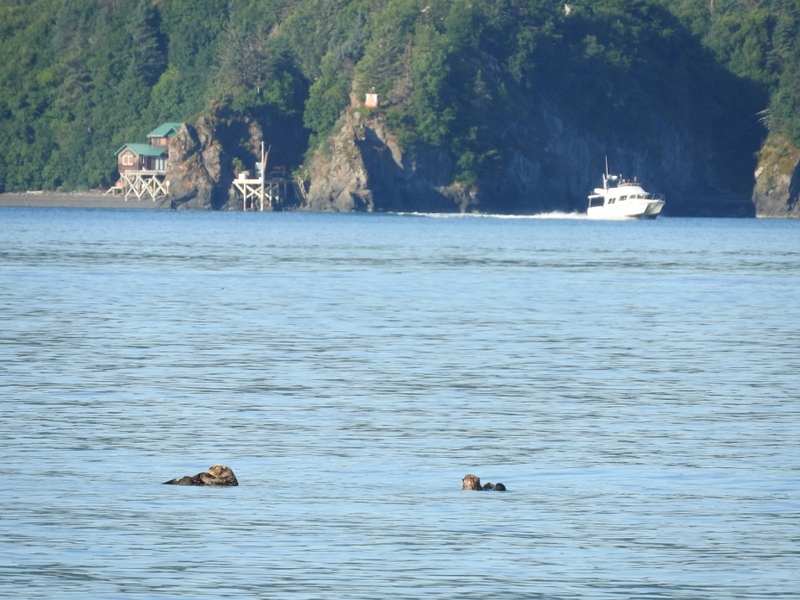 Sea otters in Kachemak Bay. 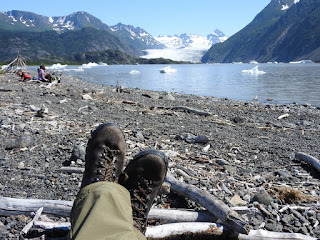 A gorgeous day by Grewingk Glacier Lake! 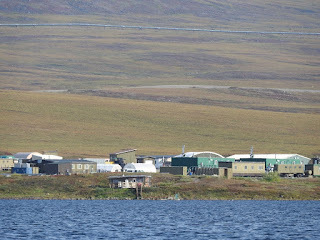 As our water taxi motored into the harbor, a gray-headed water bird floated around the corner of a barnacle-crusted rock. 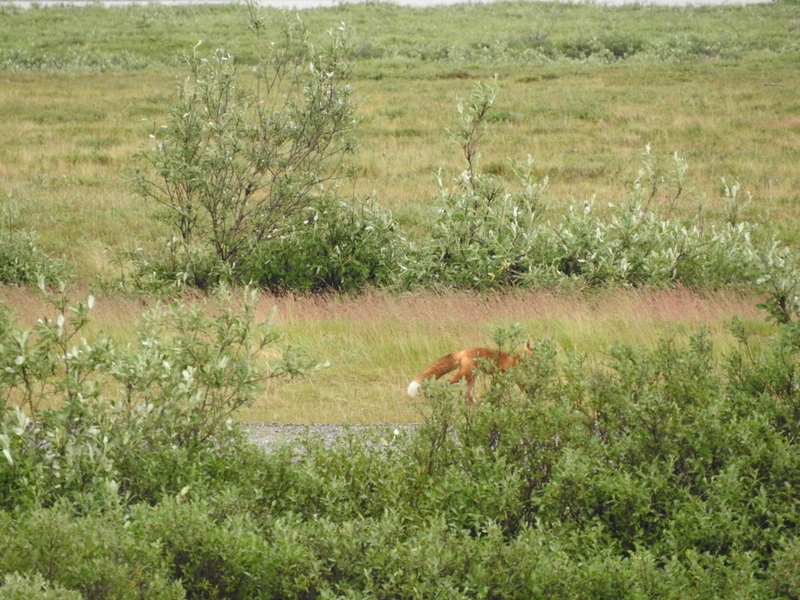 I snapped two quick photos, then zoomed in on my screen. 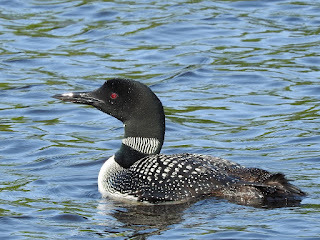 Pacific loons are the most numerous of the five loon species. Photo by Emily Stone. The profile was unmistakably loon. 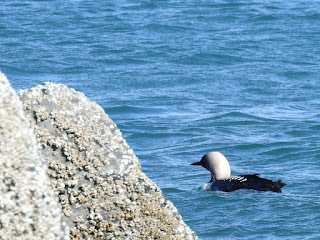 Its pale gray head, black and white stripes down the side of its neck, and smaller checkered patch on its back distinguished it from our common loons, and narrowed the ID down to a Pacific or Arctic loon. The two species look almost identical, and Pacific loons were only classified as their own species in 1985! The range maps for each species made ID easy, though. Pacific loons are found throughout Alaska, while Arctic loons are rare visitors. 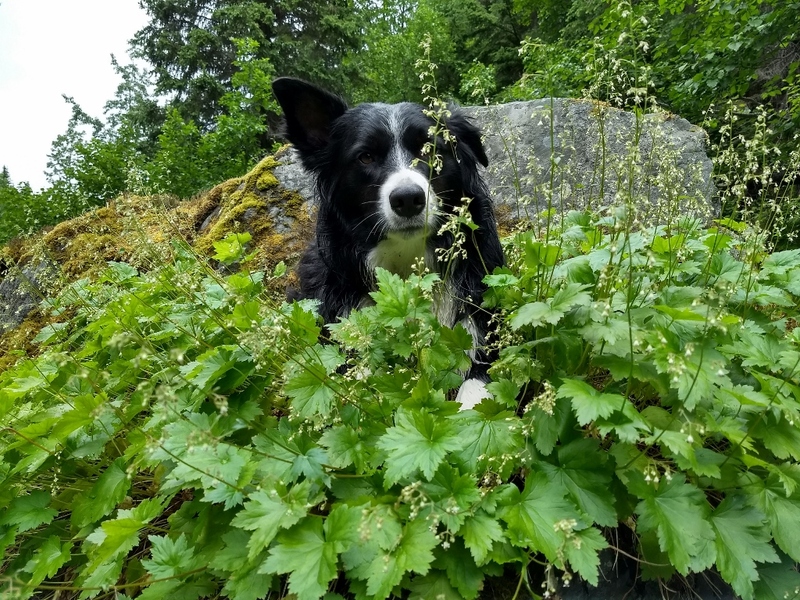 Other than being slightly smaller than the common loon and nesting on lakes above tree line, the life history of Pacific loons is very similar to our familiar ones. They nest on shore, eat a variety of small fish, need a long runway to take off from the water, and are clumsy on land. In a unique twist, the ones that winter off the coast of Japan have been observed cooperating with each other to concentrate schools of fish. Having spotted one new species of loon, my interest in seeing the others now grew. The afternoon that I arrived at the Toolik Field Station to prepare for doing caribou research, I took a short walk around the base to get a feel for the area. 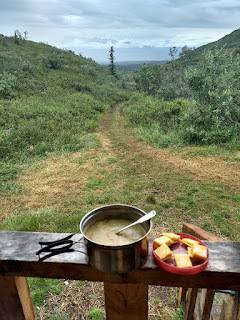 The tremolo of a loon flying overhead sent a thrill down my spine, and I watched the large bird land on the far side of Toolik Lake. Was it a common loon? It sounded similar. 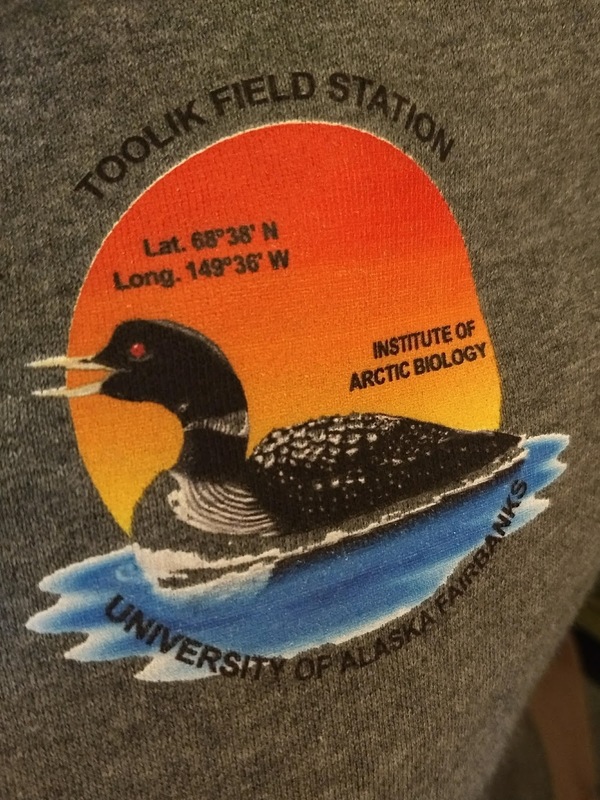 But the logo for Toolik features a yellow-billed loon, and I was sure the scientists would have chosen it deliberately. 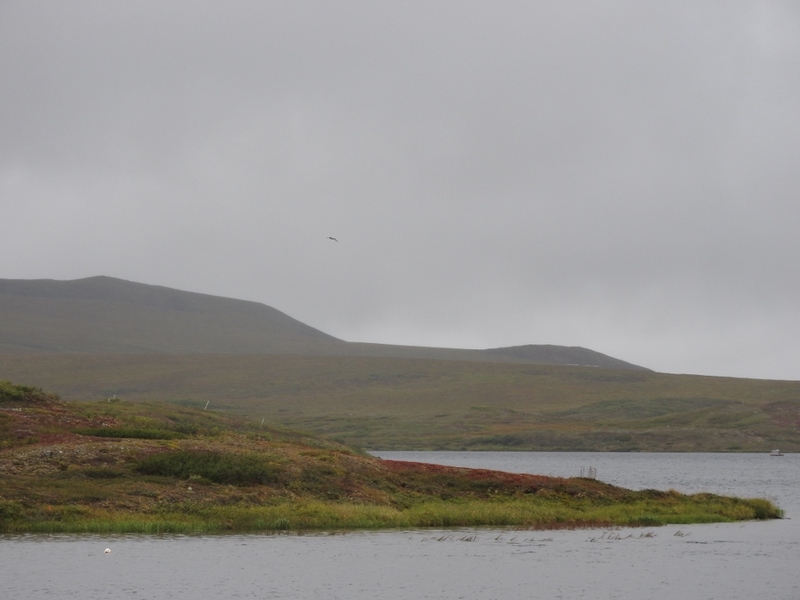 Toolik Lake--the tremelo-ing loon had just landed beyond that point. 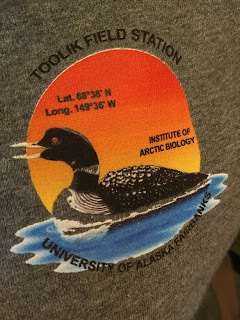 Yellow-billed loon on the logo of my awesome new sweatshirt! 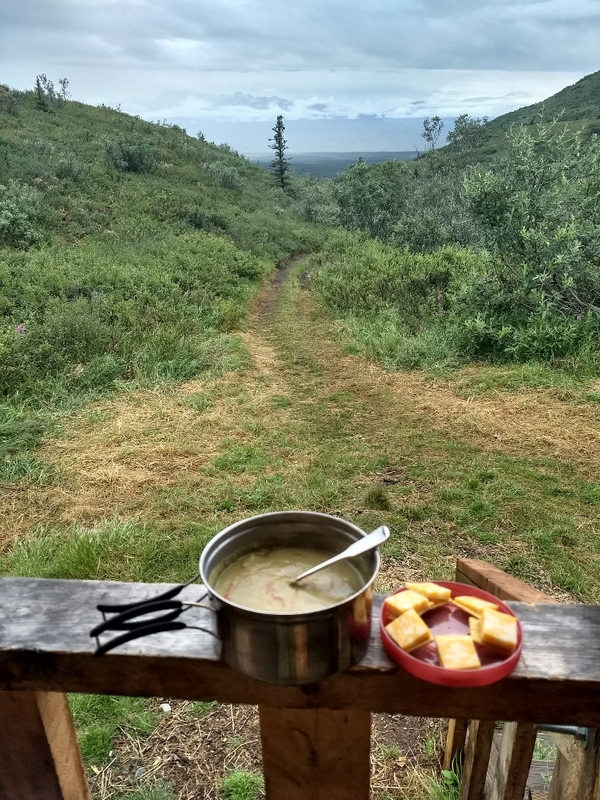 During my return trip across the Toolik Lake Inlet and back toward the dining hall, I spotted a couple of loons fishing at the mouth of that little creek. 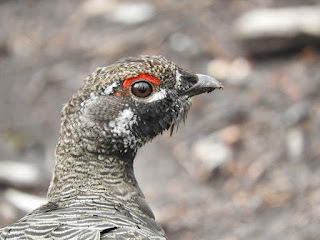 Using my camera’s zoom again, I examined the black and white plumage—exactly like a common loon’s—and peered excitedly at the pale-colored bill where I usually see black. Not only were these my sought-after yellow-billed loons, but the pair was feeding their chick little minnows, in exactly the same way that I’ve watched common loons feed their young on my Loon Pontoon Tours! I later read that a pair raises chicks there almost every year. 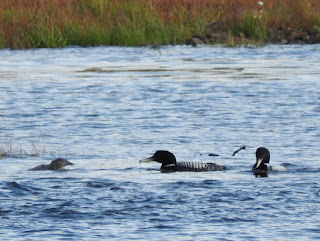 Yellow-billed loons are close relatives of our local common loons, with similar breeding and feeding behaviors. It’s no surprise that these pale-beaked loons feel so similar to my old friends. Scientists theorize that common and yellow-billed loons only diverged into separate species during the last glacial period, 100,000 years ago or so. Ice separated loons living in the continental U.S. from loons living in the far north along the Arctic Ocean. 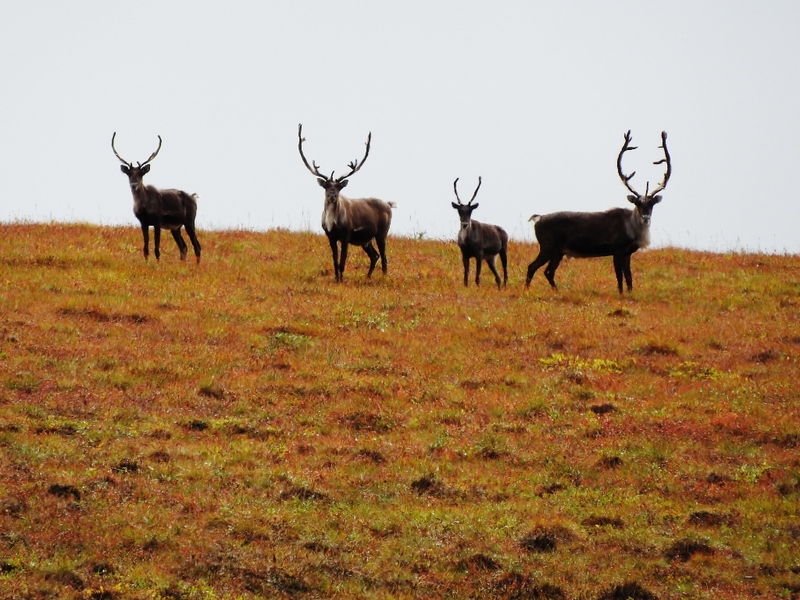 Many of their breeding, feeding, and behavioral traits remain similar. The yellow-billed loon is the least numerous of the five loon species, as well as the largest. 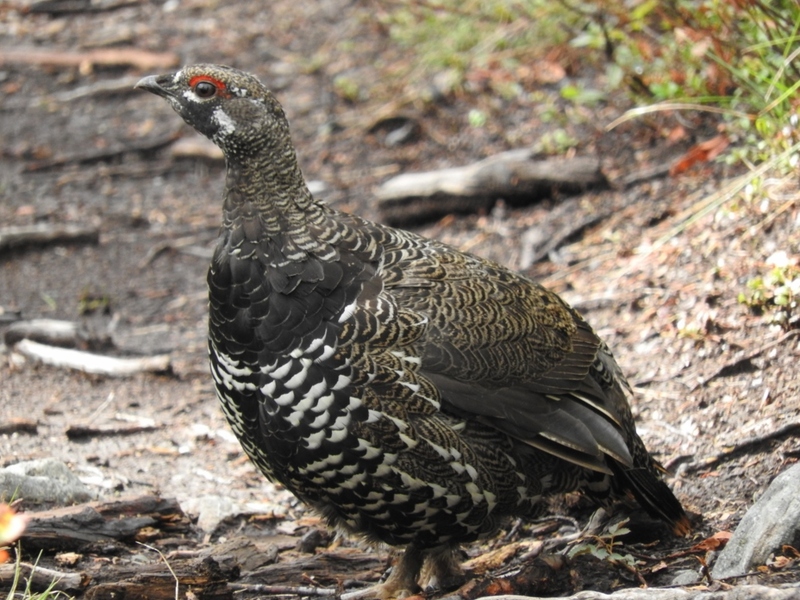 And, probably due to its larger size, it also has a deeper voice than our common loons. 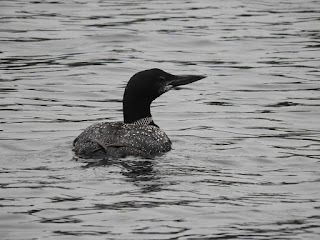 Now that I’d seen the most similar loon to the ones I’d left back home, my last goal was to see the most different loon. Red-throated loons were probably the first loon species to evolve their current form, about 21,400,000 years ago. They are also the smallest, and weigh only 2-6 pounds compared to the yellow-billed’s 9-14 pounds. 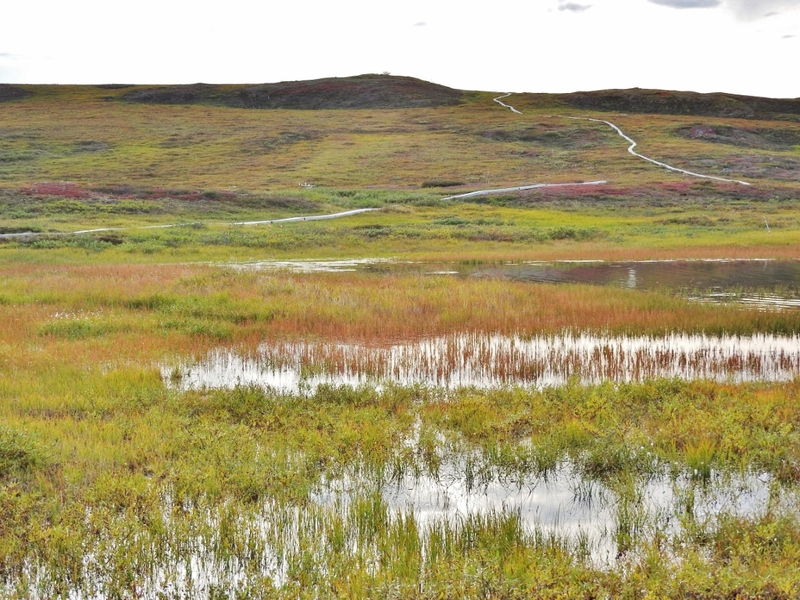 Due to their size, red-throated loons can use smaller ponds, take off directly from water or land without a runway, and breed even on the northernmost coast of Greenland. 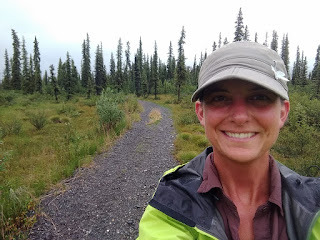 Tessa and I had barely started our second day of driving the caribou transect together, when I spotted a suspicious bird on a puddle a mile or so south of Deadhorse. I zoomed all the way in and steadied my camera on the truck’s open window, snapping shots until the bird took off in a shower of water droplets. Eager to find caribou, we got going, too. 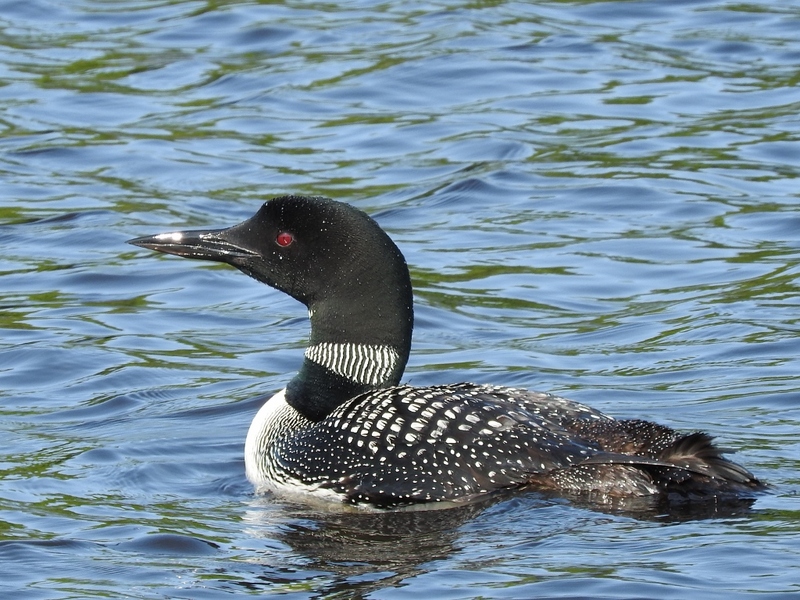 It wasn’t until I loaded the photos onto my laptop that I noticed the loon’s red throat. Red-throated loons can be hard to find in the U.S., but are actually the most widely distributed loon and range across the far north of North America, Europe, Greenland, and Asia. 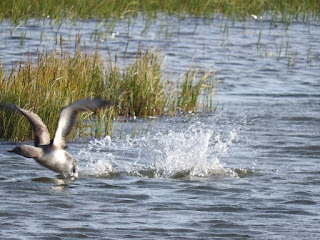 They can get airborne without a long runway, which allows them to use smaller bodies of water. Photo by Emily Stone. 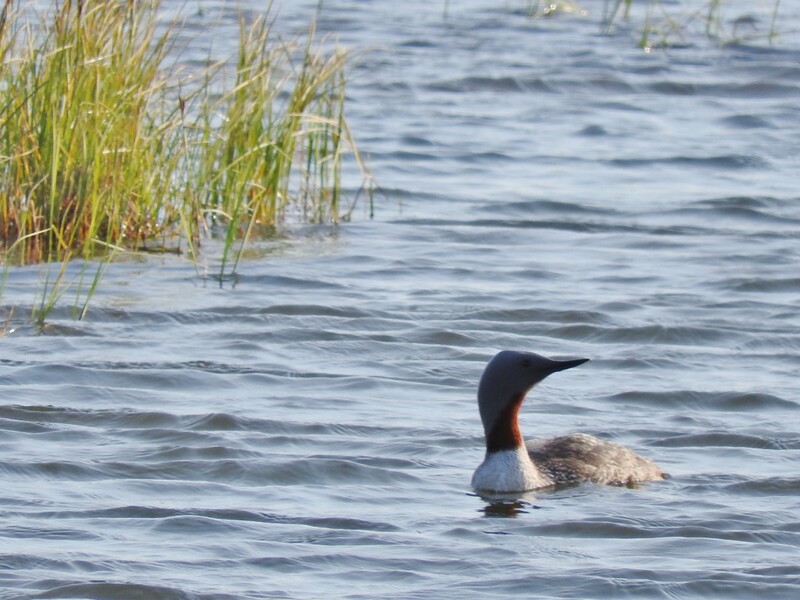 Look as we might on three more days of driving, I never caught sight of that red-throated loon again. 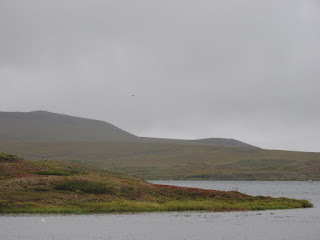 Maybe someday—while I’m out looking for gray-headed chickadees in Scandinavia, Russia, or northern Japan—I’ll be lucky enough to spot an Arctic loon as well. 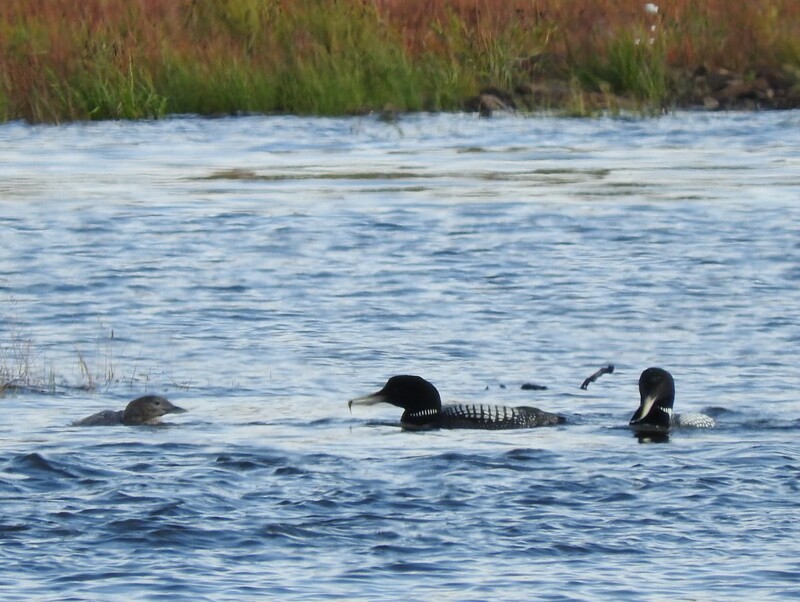 In the meantime, I was happy to return home in time to see the common loons on Lake Namakagon. 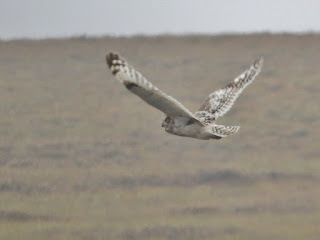 My journey has ended, and their fall migration has begun. This common loon has started its fall molt and is sporting white scruff on its face. Time to fly, little buddy! Photo by Emily Stone. 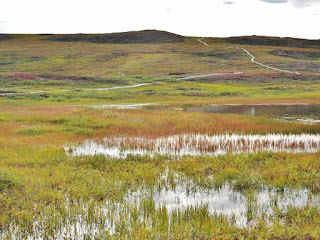 Toolik Field Station has a network of narrow boardwalks to help researchers get to study sites without trampling the tundra they are studying. If anyone had seen my erratic progress across the open tundra they might have assumed me possessed. 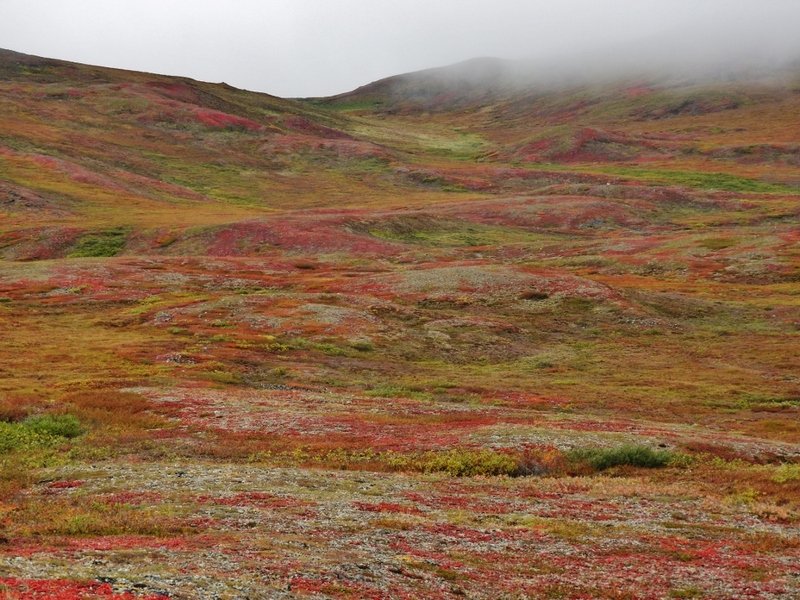 Thankfully, rolling hills of glacial sediment hid me from the view of what little civilization hummed nearby at the Toolik Field Station. 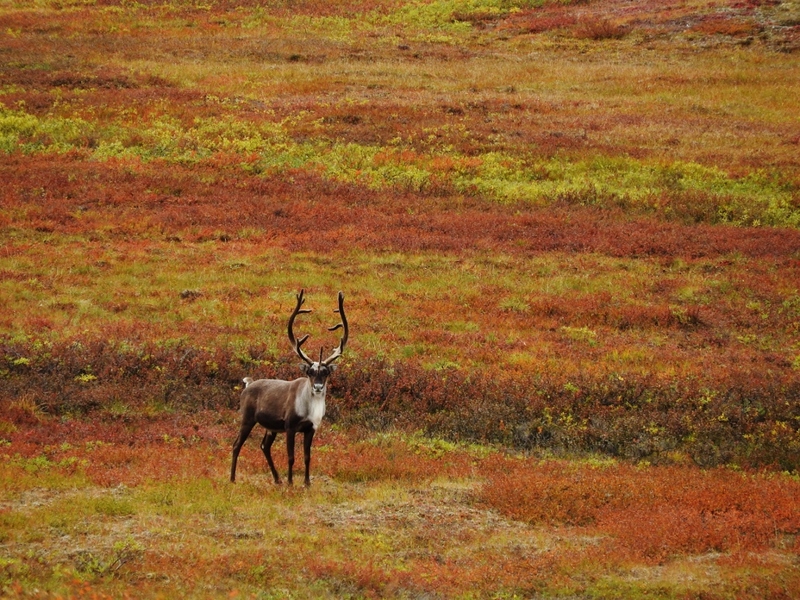 Careening from one burst of beauty to the next, I was reveling in the gorgeous rainbows that autumn (i.e. late August) had flung across the landscape. 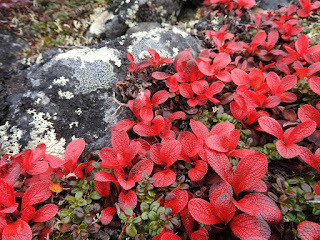 Scarlet carpets of alpine bearberry clustered around boulders. 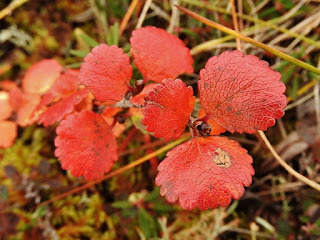 Thickets of dwarf birch sported leafy little doilies in gradients of red and orange. 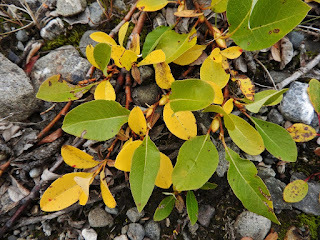 Willows claimed the most vibrant, glossy yellows for their own adornment, but sneakily retained all my favorite shades of green as well. 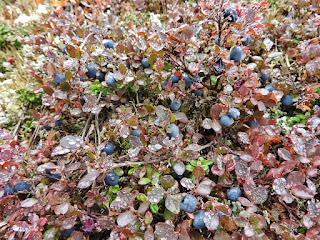 Blue and purple found their homes in the berries and leaves of bog blueberry. 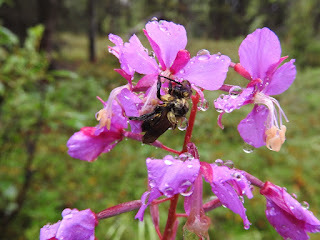 Camera in hand, I raced to create a lasting record of my amazement. 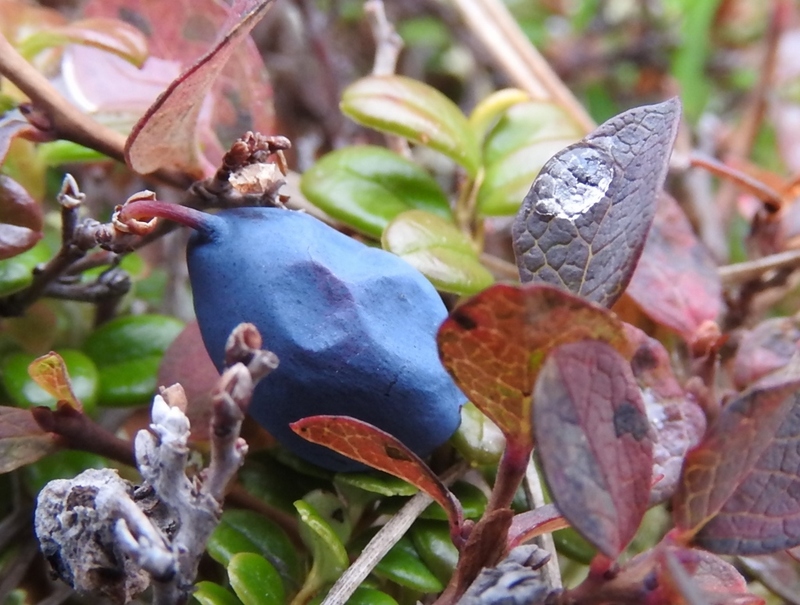 Alpine bearberry (Arctostaphylos alpina) is a circumpolar plant that grows all around the top of the globe. 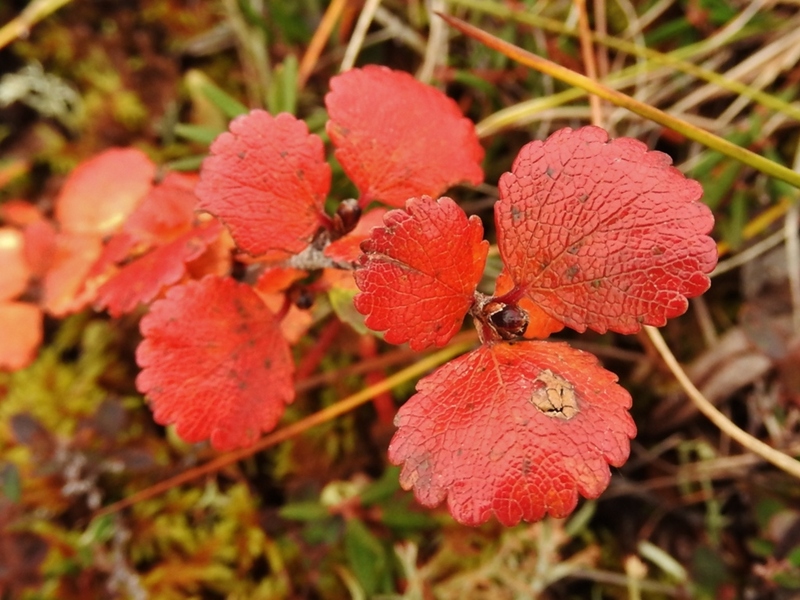 Its scarlet leaves carpet the autumn tundra and lingonberry leaves peek through. 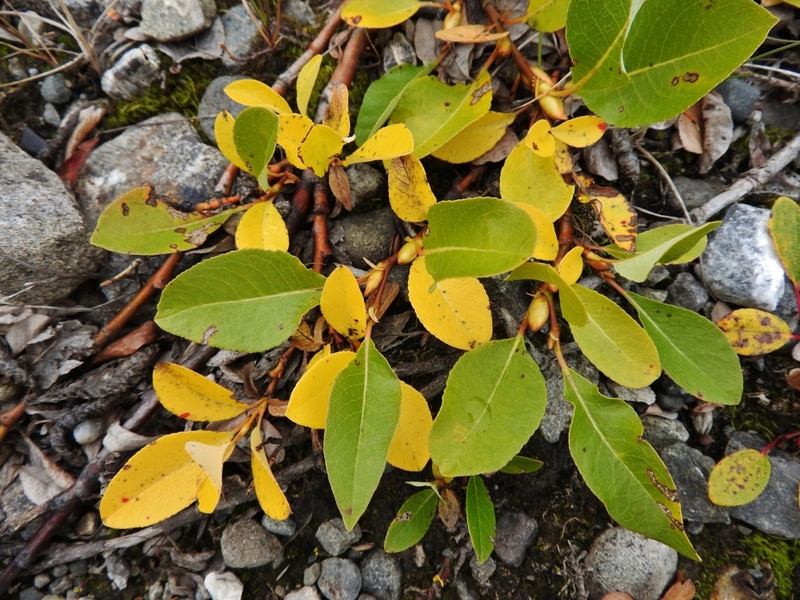 One of several species of willows that grow low on the tundra. 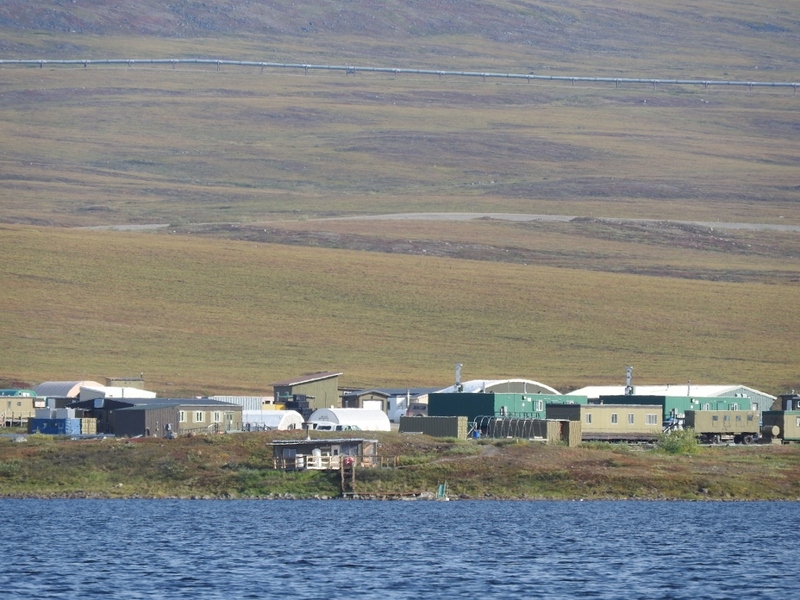 Toolik Field Station, as viewed from Toolik Lake! Mountains! There's something beyond the fog! 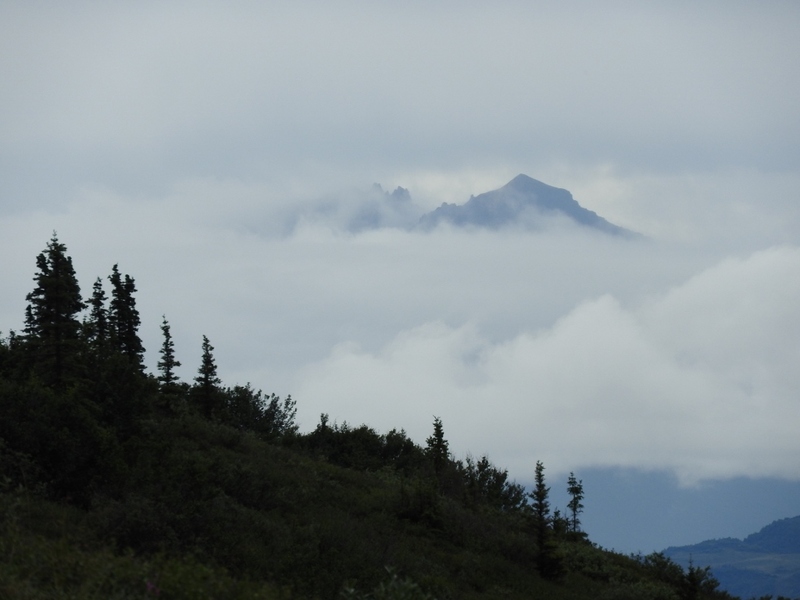 In Alaska, they call the first coating of snow "termination dust." Tessa, a grad student almost finished with her moose research who was helping her lab-mate Scott with his caribou research. 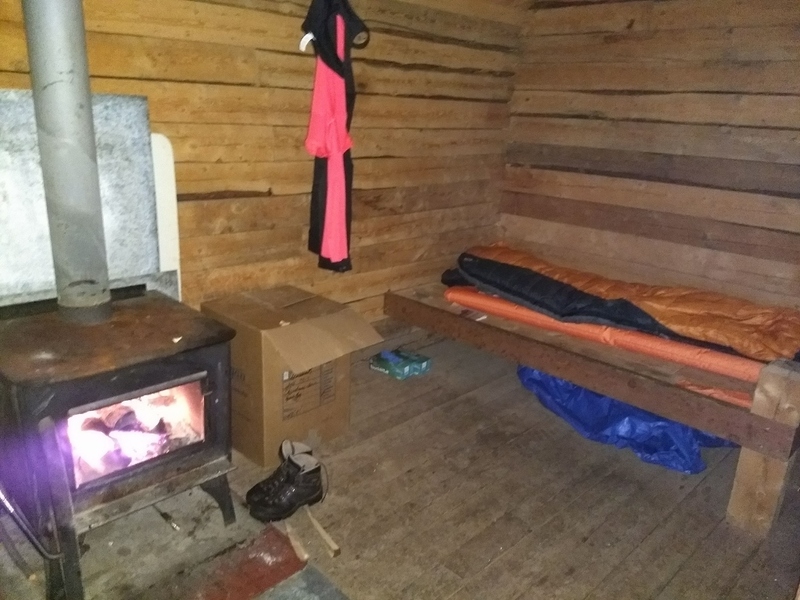 The sauna at Toolik Lake. 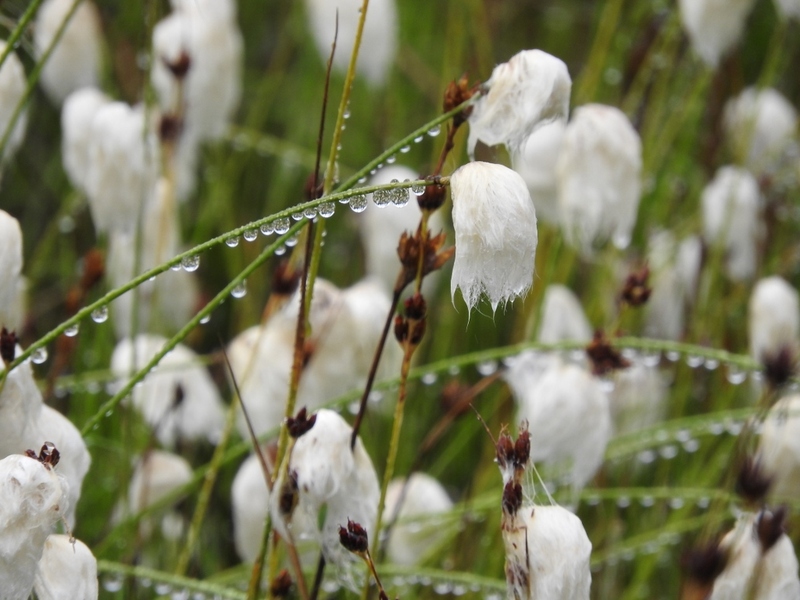 Soggy cottongrass. Also resigned to being out in the rain. The rain held off for the rest of my three-mile hike to the rustic log cabin. 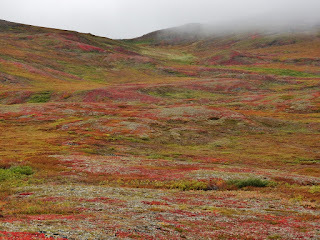 It waited until I’d had a nice chat with two hikers from France who were exploring the hills above the cabin, and until I’d had a chance to wade through knee-high tundra shrubs up there, too. Then, while I cooked pea soup, sat by a cheerfully crackling fire, painted flowers on postcards, and slept on the wooden bunk, it poured. 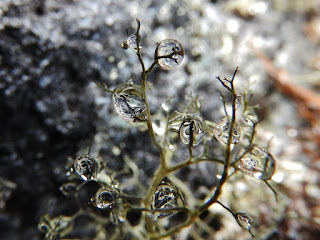 By morning, rain turned to drizzle, drizzle turned to fog, and then the fog lifted. 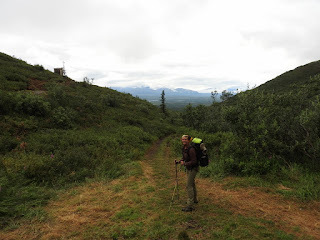 When I started my hike back down to the road, my camera was slung handily over my shoulder. Sunshine peeked through the clouds with increasing resolve. 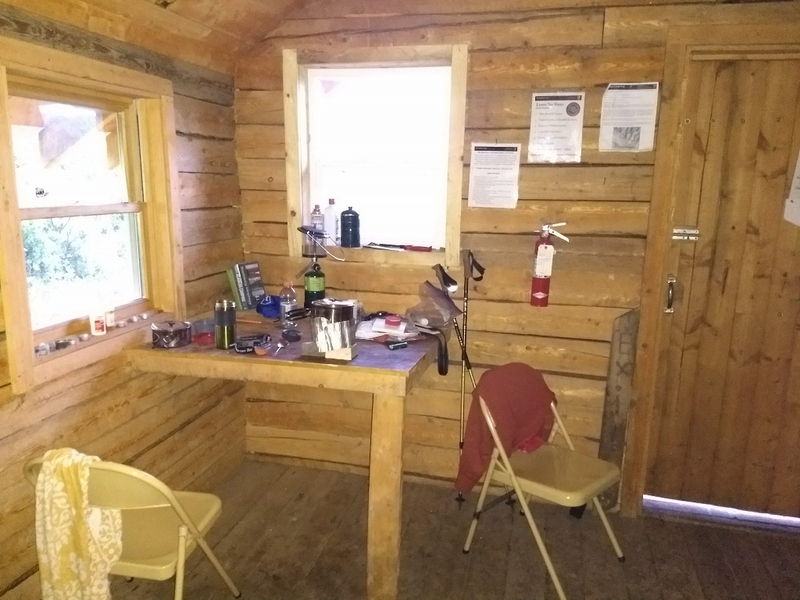 Caribou Creek Cabin and Outhouse. Clouds parted just a bit. There are mountains out there! Pea soup with cheese, crackers, and hot sauce. 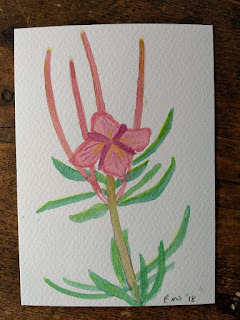 Postcard watercolor of a dwarf fireweed flower. 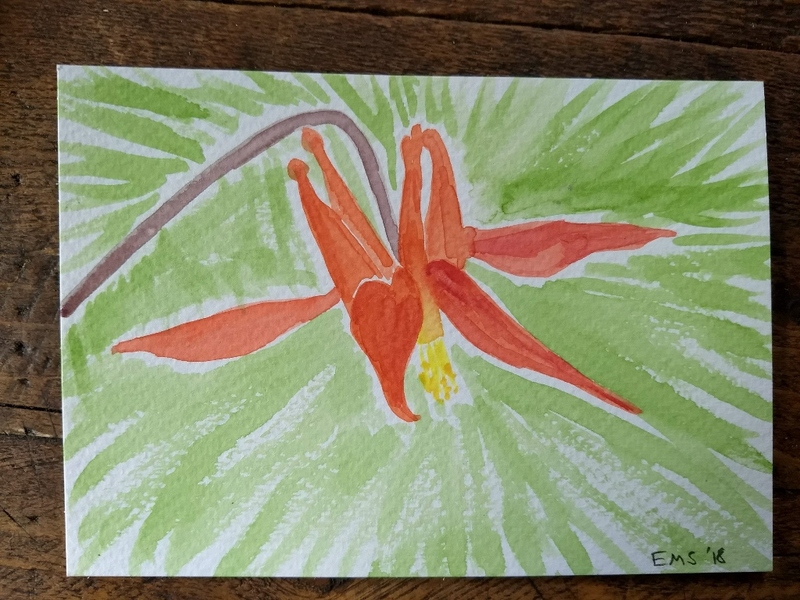 Postcard watercolor of a columbine flower. 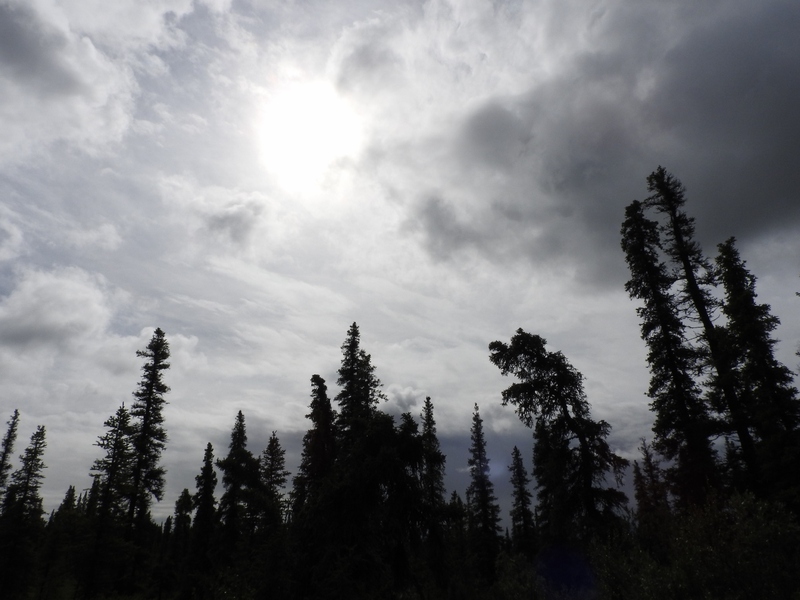 Setting out with clearing skies! Such a handsome spruce grouse! I took advantage of the free Wi-Fi at the Slana Ranger station to post photos to Instagram (follow me @emilysnaturalconnections). 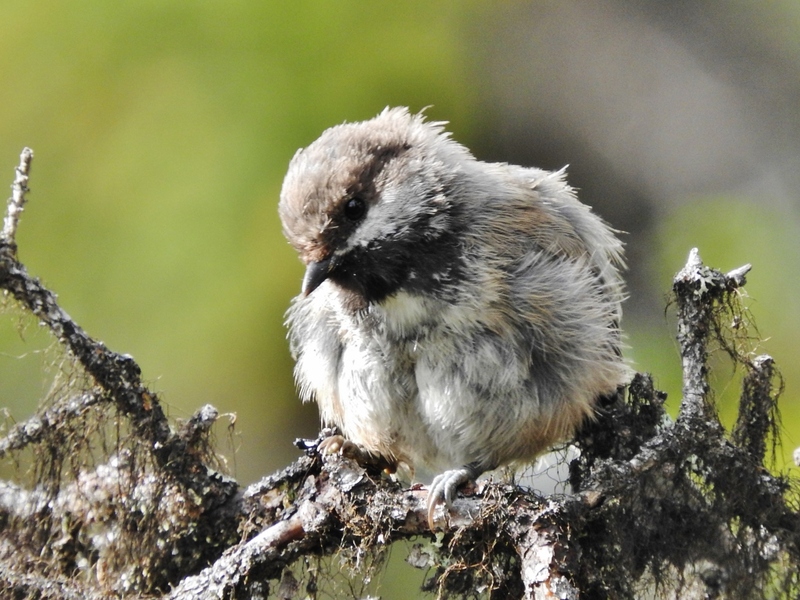 Of course, I included a chickadee. 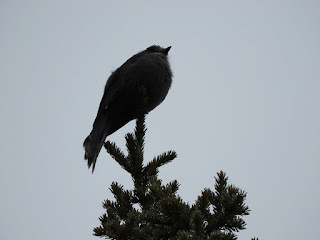 At my next encounter with Wi-Fi, a comment popped up on that post “Is that a gray-headed chickadee?” asked @thetundratelegraph. 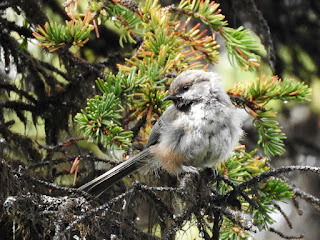 “Boreal chickadee,” I replied. 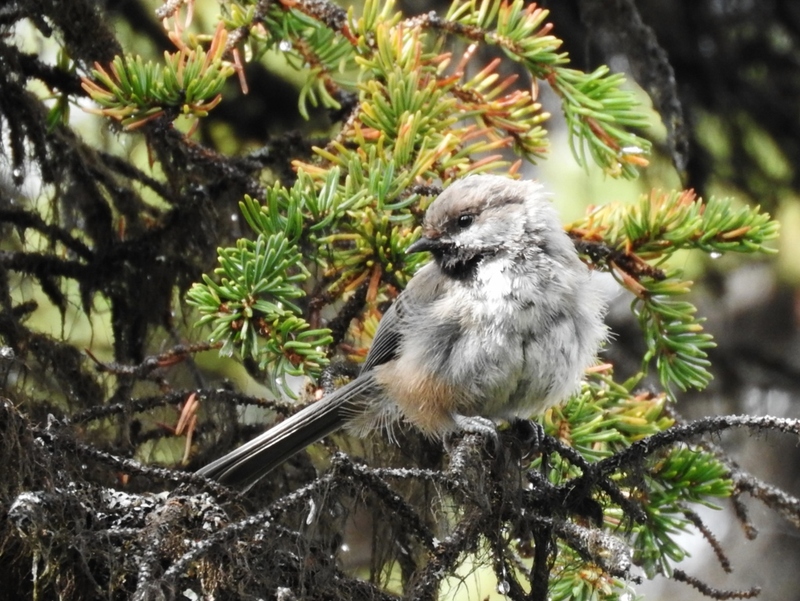 There is no such thing as a gray-headed chickadee, I thought to myself. “He looks so gray to me!” the commenter responded. 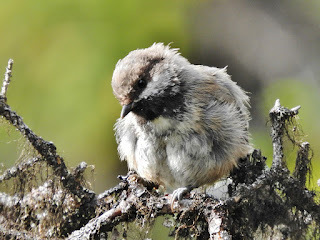 Thanks for the good photos of the chickadee and honest assessment. 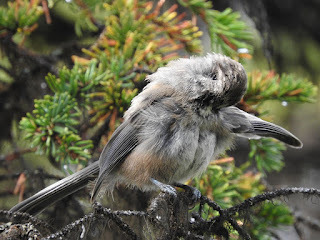 I believe this is a Boreal Chickadee due to the light facial patch not extending to the nape as extensively as a Gray-headed would. Also, Gray-headed Chickadees typically are more contrasting in their white/brown-gray head tones than Boreal are. If you agree and would like to change the species in your report it is easily done otherwise I can simply categorize it as unconfirmed. Thank you for your time taken to report this species. Keep it up! Disappointing, but not surprising. It's nice to have an expert birder weigh in. I changed the species in my report.